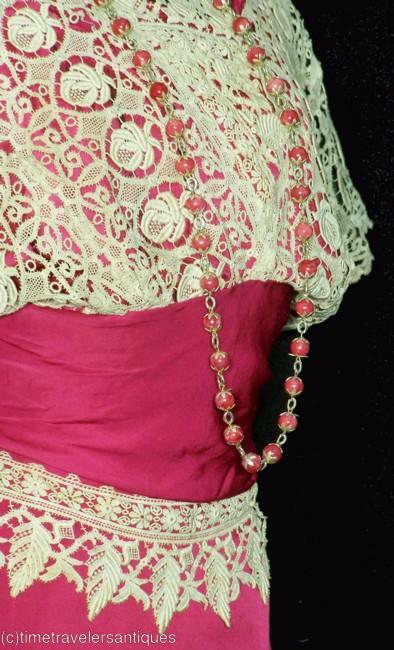 Offered for study, an original circa 1908 lady's bright fuchsia silk satin dinner gown with an overlaid chemical lace bodice and waistband accent. Stayed, with a back hook and eye closure and a lovely bunted drape at the back. Shown with a necklace that is not included. A 32" bust, 24" waist, and 55" from shoulder to front hem. Offered for study, with a shattered bodice lining, some tiny surface age flaws from normal use, and some minor soiling at the hem. 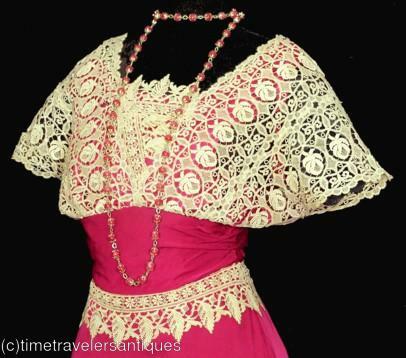 All is reflected in the reserve price for this striking Edwardian era dinner gown. I almost think this might have had some netting or some sort of overlay and it got dismantled later on. However, I really like this gown simply because it shows how unafraid our ancestors were of color.